How do I upload my music collection? 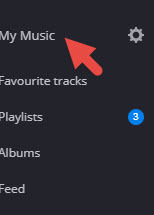 1.Navigate to the gear icon near your profile image and click on "My Music"
2.Navigate to "More" tab and choose "My MP3s"
4.In the dialog window choose song/s and finally choose "Open"
1. Only file/s are allowed . Entire folders can't be uploaded . 2. Only MP3 files are allowed . 3. If you upload a big number of files do not refresh the page . (It is better to know exactly how many files you have uploaded because the added files are appearing in the library while uploaded. As for now this is the only indication to know if the upload process was completed . We advise you to upload your MP3 with CBR (Constant Bit Rate) MP3 format under 200mb in size and only on PC. How do you copy own music on another programme on the same PC to deezer? Great article @Noam Asulin! Here's some additional information for everyone! @Leigh.Howlett I moved your topic to this great article. Does that answer your question? Let me know if there are any further questions. I'm happy to answer them! Your instruction are clear, yet I do not seem to have a " More" tab on my music or " my mp3s" on my playlist. What am not looking at?? It depends . If you are using the mobile app you won't see it . You need to do it via the web site . This is what you doing ? Hi there! I’m on my Pc. Well it might be my fault . You need to press on "My Music" and not on the gear icon itself . are you using the windows 10 app ? My deezer is version 3.3.7.0. Does that help? My tip is relevant for web only . Uploading MP3 files is available from the web UI only . I can’t upload my personal mp3 ‘s then!! OMG!-! Thank you so much! I have opened Pandors’s box!! One happy music lover here. I uploaded my songs, but it says that they're not available right now. Please explain further . What did you do exactly ? how can i add my own music track to deezer.